An RSU 29 school bus collided with a vehicle in Market Square at the intersection of Court and Main streets early Tuesday morning. HOULTON, Maine — An RSU 29 school bus collided with a vehicle in Market Square at the intersection of Court and Main streets early Tuesday morning. No students were on the bus at the time of the crash. 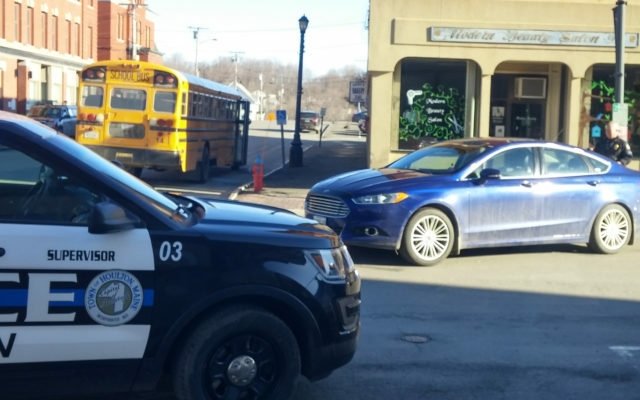 According to Houlton Police Chief Tim DeLucca, the operator of the school bus, Suzanne Lawlor was driving north on Court Street around 7:45 a.m. when she entered the intersection of Market Square. The bus collided with a 2014 Ford Fusion operated by Darcy Oliver, who was heading east onto Main Street. The bus impacted the rear passenger side of Oliver’s vehicle and the force of the impact spun her car into the opposite direction. Oliver’s vehicle had significant damage to the passenger side of her vehicle and had to be towed from the scene. The bus sustained some front end damage but could be driven from the scene. Traffic was blocked for a short period of time as Houlton Police Sgt. Matt Quint investigated the crash. Chief DeLuca said the incident is still under investigation. No charges had been filed as of Tuesday morning.